Temporary architecture is flourishing in our urban public spaces. Branded ‘pop-ups’ and follies to provide a moment of light entertainment they are in fact borne of a long history of more holistic architecture that is subtly suggesting how we could live, work and play more harmoniously together. Featuring revealing interviews with 13 young, emerging and socially-minded practices from New York and Santiago to London, Berlin and Zurich it also analyses this phenomenon in critical essays by well-respected practitioners and thinkers. 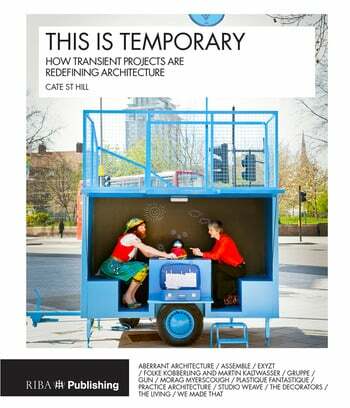 Providing a highly personal insight into the architects’ experience, the design process, the challenges they encountered and how it affected their practice it sheds light on the growth of multidisciplinary collectives, community engagement and more participatory ways of designing, making and building. Including highly illustrated and imaginative projects ranging from a floating cinema and tiny travelling theatre, through ad-hoc structures made of found objects and discarded materials, and blow-up plastic bubbles, to a community lido and market restaurant this will open your eyes as to what is possible in architecture.